A literal equation is an equation which consists primarily of letters. Formulas are an example of literal equations. are two sides in a rectangle. one side of the equals sign. We have to be told for which variable we want to solve. We started with " P = ..." and ended with " W = ... ". That's what it means to "solve a literal equation." 1. Identify the variable that you want to have alone. 2. Treat all other letters as if they were numbers. You can add, subtract, or multiply by a letter. You can also divide by a variable as long as it is never zero. 3. Use all of the rules of algebra that you learned to solve equations in the past. You may need to add the opposite of a variable to both sides of an equation. You might have to multiply both sides by the reciprocal of the variable. All rules of algebra apply. 4. Get the variable you want by itself on one side of the equation. 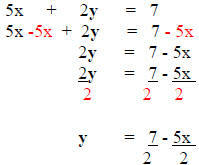 Solve 5x + 2y = 7 for "y". Identify "y" as the variable you want alone. Add the opposite of 5x to both sides. Divide all terms on both sides by the coefficient of "y"
Identify "h" as the variable you want alone. Divide both sides by the factors 2πR. To solve for h, add the opposite of R to both sides. 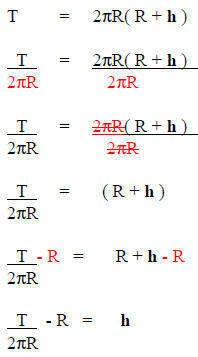 Multiply the numerator and denominator of R by 2πR. Simplify. R times R is R2. 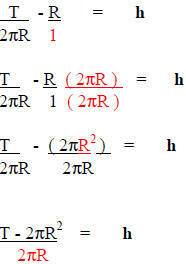 Write answer over the common denominator 2πR.